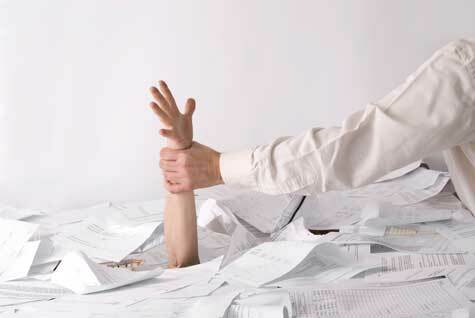 Businesses run on paperwork. No matter how much the new age proponents beat the drums of paperless offices, we are still very far away from the realisation of that vision. If you only consider it, you’ll realise that if your business was a living and breathing organism, then your communication channels would be its nervous system while documents would be the blood in its circulation system. Orders may be given on phone but the really important decisions are almost always sent over in a written form. This isn’t unlike the human body where blood often carries some of the most complex hormonal and enzymes based decisions to the far corners of the body. Keeping that in mind, let us ask you a question. How do you think your business body is feeling? Do you think it feels clogged up somewhere or inefficient? Do you think that all those documents that your business relies on are not reaching the right storage points? 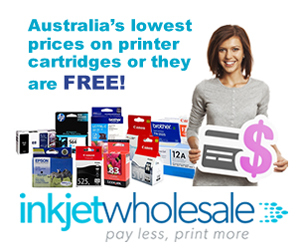 In simpler words, do you have trouble finding an old document every time you go looking for one? If your answer to this is a ‘yes’, then the problem is nothing but your office filing system. You may not believe it or may not even want to believe it but most businesses make the mistake of not taking office filing seriously. There is a solid reason why this happens. When a business is established, the entrepreneur’s first priority is to break even. The next priority is to move beyond the no profit – no loss dynamic and start making some money. It is common for businesses to start considering office filing because they want to make profits or just after they start making money. The objective in such stressful times is speed as opposed to efficiency. This is because the business is still not swamped in a lot of documents. So, office filing is designed for smaller quantity. Now, when the business grows, such office filing systems are found wanting. However, since the business has already considered their office filing once, they think nothing more can be done. Thus, the business continues using an obsolete system simply because they didn’t pay enough attention while setting it up. We’re here to help you avoid that mistake. 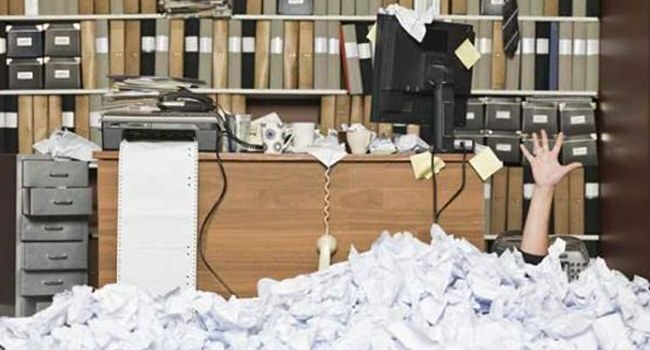 Here is a step by step guide on how you should set up a reliable and scalable office filing system. 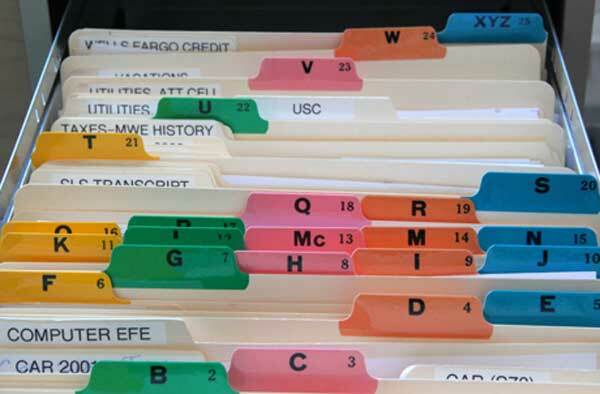 There are many different types of office filing systems in use today. Of the numerous ones in use, five are the most important because all other systems are derived from them. 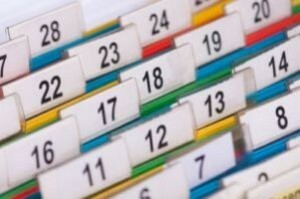 These five office filing systems are alphabetic, numeric, geographic, chronologic, and subject based. Each of them has their own benefits and limitations, as we explained in this post here. Crucially, while some businesses will have the option of choosing any of these five office filing systems, in certain business platforms one or two may be more suited. 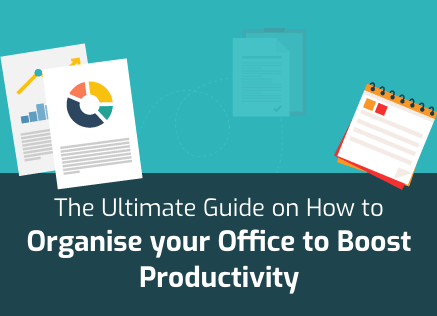 For instance, businesses that have repetitive tasks at regular intervals may benefit from a chronological office filing system much more than any of the others. Similarly, larger businesses tend to become even more efficient with the numerical office filing system while smaller businesses should function well with alphabetic systems. It’s also important to note that businesses that have special requirements will do better with subject based office filing systems. If your business is in its nascent stage, then it is highly unlikely that it’ll be generating too many documents. In fact, most fledgling businesses can usually work well with a single layer office filing system. However, this is where the problem begins. Because younger businesses function fine with single layer office filing systems, they don’t introduce multiple layers. However, these businesses would’ve been better advised to go with multiple layer office filing systems because that would’ve set them up better for future growth. In simpler words, creating multiple layer office filing systems is important for businesses because of two benefits. The first and the more obvious one is that multiple layer office filing systems can handle a greater quantity of documents than a single layer system can. The other benefit of multiple layer office filing systems is that they become useful in a wide variety of ways because they are easily modifiable. For instance, if you need to change one category, the sub layers will allow you to change the category without affecting a large set of documents. Thus, multiple files will not be retagged and relabelled. Multiple layer office filing systems are also more beneficial because they are more scalable than single layer filing systems. Simply speaking, you can add more categories if there are multiple layers. In fact, you can even add another layer where required. Certain office filing systems require a separate Index file while some will require labelling key. For instance, in numerical office filing systems, finding a document will become very difficult without a separate index to consult. After all, how will you know which codes and numbers mean which files without such an index? Similarly, labelling keys are important when you have a subject based office filing system. Here, it may not be obvious which subjects go into which category. Creating a labelling key will help with this. In most office filing systems, colour coding can be seen as a huge improvement. The reason for this is simply that colour codes make it easier for people to distinguish one file from another. This speeds up the searching process for the office employees. Having an office filing system is very important for a growing business but the system can’t make any difference by itself. It needs to be supplemented with the right equipment. 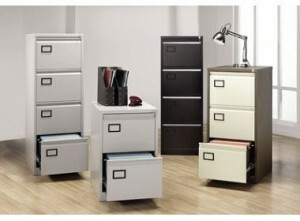 Your search for office filing equipment will begin with cabinets. There is no dearth of options in the market for office filing cabinets. Typically, smaller businesses use simple metal or wooden cabinets while larger offices have huge sliding cabinets to save space. It is also advisable for you to deploy hanging folders instead of just stuffing your documents and files into a cabinet. Hanging documents will not only make the office more efficient but will also give your office a sense of composure and professionalism. We also recommend that keeping supplies ready. Don’t think that, once you’ve set up your office filing system, you’ll never need those pins, markers, and labellers again. 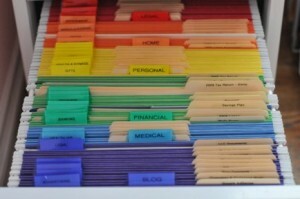 Your office filing system will evolve as your business evolves. So, it’s important to be preparing for that evolution by keeping supplies ready. Setting up an office filing system is like time travel because it’s all about solving a problem. You’re not only solving a problem now but also solving problems in the future by your actions today. The trick is to project and predict what those problems of the future will be. While you’ll never be able to get them all, just imagine how easier your life could be if you figured out 6 out of 10 future problems. Most entrepreneurs know where their businesses are heading as well as where they want them to head to. The best way to plan for the future is to find the midpoint between where your business is heading and where you want it to head to. On the ground level, this means that if you think you need two filing cabinets, then you should get three.